This afternoon my father-in-law, Jan, was freed from the cares and pains of his physical body and passed to the other side. I know there was a joyous reunion awaiting him with his parents and his siblings that have gone on before him. I know this without a shadow of a doubt. Like births, graduations, and marriages I view deaths as "rites of passage" as part of each of our existences. Death is, in its own way, a "graduation". So this tribute is not meant to be one of grief and sorrow. Instead, I wanted to publish a celebration of what Jan loved. He loved the Lord and his family most. Very close after those came his love for the things of nature. 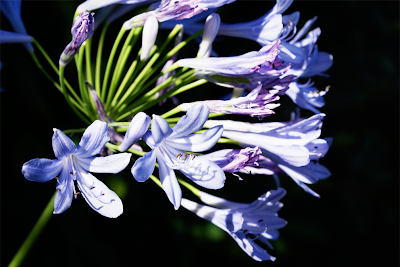 I have had many opportunities to shoot photographs in the gardens that Jan enjoyed around the home he shared with my mother-in-law, Beth. 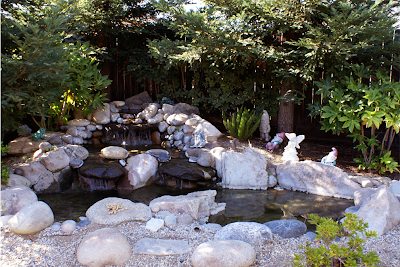 He and his lovely wife worked with landscape architects and gardeners to make the gardens fit the vision they both had with redwood stands providing shade from the intense heat of California's Central Valley. Jan and Beth's vision also included places where birds feed, nest and find safety. Jan loved the birds that came to visit the garden. He doted on them with the best seed contained in the best feeders. I even convinced him that even though Scrub Jays sometimes have a predatory tendency on other birds, they also are a wonderful garden ally for eliminating snails and other pests. Jan would put out a pile of peanuts by the pond especially for the Scrub Jays (you can see the peanuts in the photo above if you click on it to enlarge). Jan enjoyed the hummingbirds the most, I think. 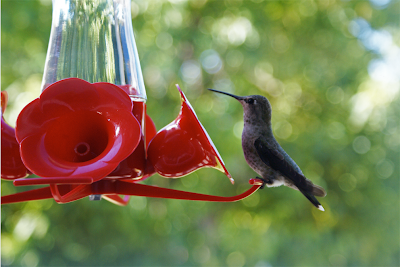 The hummingbird feeder hanging right outside their family room window provides wonderful views of their tiny beauty. 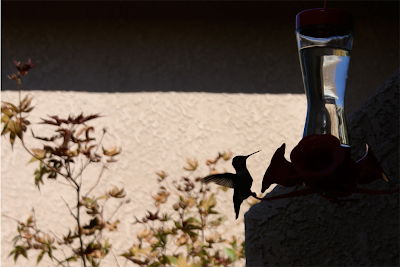 I've always noted that "his" hummingbirds were always more polite to one another than the cantankerous and territorial little ones I have in my own garden. Jan was also a very talented painting artist as well as an avid art collector. His own paintings and those he collected all contain the beauties of nature. He and I would love to sit and appreciate art, birds and gardens--usually with only a few choice words. Just two months ago, Jan shared with me his secret to having a crop of large and luscious peaches every year by selectively thinning the clusters of fruit when they are small. Now every time I thin my Pippins on the apple tree, I think of him and employ his wise counsel. This is not a goodbye, dear Dad. You and I always knew that even though a hummingbird would take wing and flit away, we would surely see it again. Dad, I know with even more surety that I will see you again. I love you. 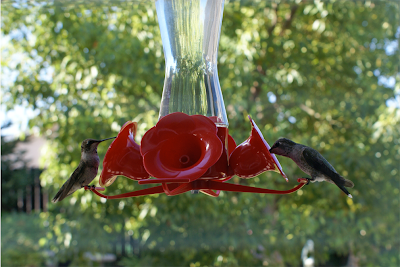 Say hello to all the hummingbirds for me. I am so sorry. I know how hopeful you were that he would recover. I understand all too well. We love you and you will be in our thoughts and prayers. My prayers are with you Cindy and Brent. I am sorry that you will miss him. A beautiful tribute to Jan and his love for the Lord. So happy he enjoyed his gardens and the birds and that you shared those pictures with us today. I will remember you all in the days to come. A lovely tribute. My thoughts are with you. What a lovely tribute, enhanced by the beautiful pictures. The last is especially, deeply poignant. Beautiful touching post to your father-in-law. My thoughts are with you and your husband. I'm so sorry but I admire your ability to write such an uplifting post at such a time. That is extremely sweet cute cousin! I'm sure he is happy & hope that none of you feel too awful...and just remember how at peace he is now. What a beautiful tribute to you dear father-in-law. I've always appreciated your grasp of eternity and how thin the veil can be for us. I know that the passing will bring some sadness, since we miss those we love so dearly. But I, like you , and so grateful for the hope of a glorious resurrection. You will be in my thoughts and prayers. What a beautiful, touching post. A fitting tribute for your father-in-law. He was a good and great man and father to me. He is survived by my mother and the 3 childrent he raised and 8 grandchildren (and our 8 cats -- they loved him too). I am certain that we will be reunited with him again when we all must make this difficult transition. "as in Adam all die, even so in Christ shall all be made alive” (1 Corinthians 15:22).". What a beautiful and poignant tribute to a clearly much loved Father in law. How lovely that you shared such an appreciation and enjoyment of nature. I am sure he will be with you as you potter around your garden. I'm so sorry for your loss. He sounds like someone I would love to get to know. What a loving tribute to your father in law! Best wishes to you and your family during this sad time. Even when we trust that we will see our loved ones again eventually, it's hard to fill the hole in our lives that they leave behind. Hopefully your sweet garden-related memories of him will continue to bring you comfort. It was nice to read what you had to say (both of you). Thank you for sharing your thoughts. I am so sorry to hear of your loss. You have written a wonderful tribute and it's so good that your faith sustains you at this sad time, it's always a comfort to have a deep faith. First, I am so sorry for your loss. Much love to you both! I am so grateful for the Lord's plan and aren't we lucky to know and have a testimony of it? It was a lovely post and tribute to your adored father in law. It seems you and he shared a love and interest for many of the beautiful things of life. All my best to you both and to your Mother in Law during this tender time. I'm sorry for your loss and very touched by this wonderful tribute to your father-in-law. I hope you all find peace in those beautiful memories. What a touching tribute to a man who appreciated the beauty of nature and surrounded himself in it. Hugs Cindy for your loss. He sounds like he left your a legacy of knowledge which you will remember as you garden throughout the seasons. You will carry him in your heart always. Oh Cindi I am ever so sorry for your loss. Losing a beloved family member is a hard thing to go through. I pray that fond memories can comfort you and your family at this time, until you are all united in the Lord's time. What a beautiful tribute, Cindy. It brought big, chubby tears to my eyes and I can feel the love that you both shared for God, nature, and each other. He sounds like a wonderful man and a blessing. I recently read on someone's site (I'm afraid I don't recall whose) that their young daughter made reference to birds being angels. What a lovely thought that is, don't you think? Cindy, I am so sorry for your family's loss of your father-in-law. He is at peace now. You have my deepest condolences.